I HAVE NO QUALIFICATIONS IN HOMEOPATHY! The reason why it is not quite as short as that lies in the the fact that homeopathy-fans regularly start foaming from the mouth when they state, and re-state, and re-state, and re-state this simple, undeniable fact. Falsified? You didn’t have any qualifications falsified or otherwise according to this. In quotes as well lol. Perhaps you could enlighten us all on this. Edzard Ernst, Professor of Complementary and Alternative Medicine (CAM) at Exeter University, is the most frequently cited „expert‟ by critics of homeopathy, but a recent interview has revealed the astounding fact that he “never completed any courses” and has no qualifications in homeopathy. What is more his principal experience in the field was when “After my state exam I worked under Dr Zimmermann at the Münchner Krankenhaus für Naturheilweisen” (Munich Hospital for Natural Healing Methods). Asked if it is true that he only worked there “for half a year”, he responded that “I am not sure … it is some time ago”! I don’t know what you got. I’m only going by your quotes above. You didn’t pass ANY exams. “Never completed any courses and has no qualifications in Homeopathy.” Those aren’t my words. LOL qualification for their cat? You didn’t even get a psuedo qualification and on top of that you practiced Homeopathy for 20 years eremember. With no qualifications. You are a fumbling and bumbling Proffessor of Cam? LOL. In fact I think I’ll make my cat a proffessor of Cam. Why not? He’ll be as qualified as you. Often, these foaming (and in their apoplectic fury badly-spelling) defenders of homeopathy state or imply that I lied about all this. Yet, it is they who are lying, if they say so. I never claimed that I got any qualifications in homeopathy; I was trained in homeopathy by doctors of considerable standing in their field just like I was trained in many other clinical skills (what is more, I published a memoir where all this is explained in full detail). In my bewilderment, I sometimes ask my accusers why they think I should have got a qualification in homeopathy. Sadly, so far, I have not received a logical answer (most of the time not even an illogical one). So, today I ask the question again: WHY SHOULD I HAVE NEEDED ANY QUALIFICATION IN HOMEOPATHY? I consider such qualifications as laughable. A proper qualification in nonsense is just nonsense! For practising homeopathy (which I did for a while), I did not need such qualifications; as a licensed physician, I was at liberty to use the treatments I felt to be adequate. For researching homeopathy (which I did too and published ~120 Medline-listed papers as a result of it), I do not need them either. Anyone can research homeopathy, and some of the most celebrated heroes of homeopathy research (e. g. Klaus Linde and Robert Mathie) do also have no such qualifications. I am therefore truly puzzled and write this post to give everyone the chance to name the reasons why they feel I needed qualifications in homeopathy. Did you know? “The skeptical movement is an offshoot of the Communist Party” !!! …there really are people who spend a lot of time and energy attacking homeopathy from the sidelines of the Internet and in print. They call themselves “skeptics”. Who are they and how did they originate? …The skeptical movement is an offshoot of the Communist Party. (Really: see the top two links below.) Its top organizers were hired by pharmaceutical company and medical industry representatives to recruit malcontents in bars to spread hate propaganda against non-conventional medical systems. One of the first such skeptic groups referred to itself as “Skeptics in the Pub”. Not surprisingly, their rants against homeopathy sound like the drunken cacophony of soccer hooligans. A “who’s who” tour would not be complete if we neglected to mention Sense about Science. This group features a prominent spokesperson who is an advertising “consultant” to pharmaceutical and oil companies. It’s been scrubbed from their website as of this writing, but they get large donations from Big Pharma. Since media skeptics are not researchers, scientists or people with any solid knowledge of any body of medical endeavour, it’s a foregone conclusion that this virtual Popcorn Gallery of respondents is completely insensible to any form of rational dialogue. As much as they would like to think that they have a mission in upholding the tenets of “science”, their propaganda tactics do not make them a party to the dialogue between holistic medical systems such as homeopathy and sincere scientific investigation. To quote Josef Stalin, they are “useful idiots” for the propaganda machine, but are not bona fide participants. The only comment posted on this site is from sandra hermann-courtney, cmt (Monday, April 08 13 06:48 pm EDT) and it reads: Thank you for posting this! Please let me take this opportunity to join Sandra and say THANK YOU, THIS IS WONDERFUL! Regular readers of this blog will find plenty of things that are familiar to them in my new book ‘SCAM’. Many of the thoughts in there were originally conceived on this blog; and quite a few ideas might even be inspired by your comments. In this way, SCAM can be seen as a big ‘thank you’ to all of my readers. I should perhaps start with a warning: this book might unsettle you. If you are a true believer in so-called alternative medicine (SCAM), you may find the things I am about to tell you disturbing. My book was not written for true believers. In my experience, they often are emotionally or intellectually unable to rationalise and to change their minds. Any attempt at opening their eyes and making them think critically might therefore be a waste of time. 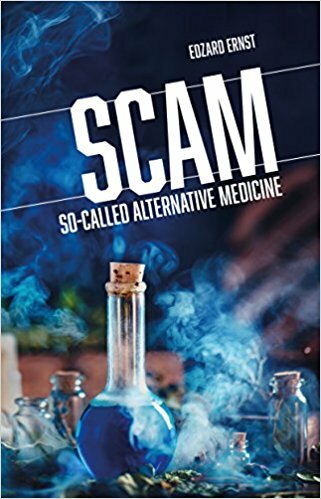 This book was written for everyone who has an interest in SCAM and is open to consider the evidence. Yet it is not a guide-book that tells you which SCAM can be employed what condition. It is a compilation of 50 essays about SCAM in more general terms. I ordered them loosely under seven headings and have tried to write them in such a way that they can be read independently. This necessitated a certain amount of repetition of crucial themes which, I hope, is forgivable. My main aim in publishing this book is to stimulate your ability to think critically about healthcare in general and, of course, about SCAM in particular. Some people say that I am fighting a losing battle and insist that SCAM cannot be defeated. It will be around for ever, they say. I quite agree with the latter parts of this statement. Humans seem to need some degree of irrationality in their lives, and SCAM certainly offers plenty of that. Moreover, conventional medicine is never going be totally perfect. Therefore, disgruntled consumers will always search elsewhere, and many of them will then find SCAM. However, I disagree with the first part of the above assumption: I did not write this book with the aim of fighting a battle against SCAM. I can even see several positive sides of SCAM. For instance, the current SCAM-boom might finally force conventional healthcare professionals to remember that time, compassion and empathy are some of their core values which cannot be delegated to others. Whatever the current popularity signifies, it is a poignant criticism of what is going on in conventional healthcare – and we would be ill-advised to ignore this criticism. In the preface, I stated that my main aim in publishing this book was to stimulate my readers’ ability to think critically about SCAM and healthcare generally. My book is therefore not a text against but as a plea for something. If reading it has, in fact, made some of my readers a little less gullible, it … could improve both their health and their bank balance. Is the Queen’s homeopath, Dr Peter Fisher, erring or lying? A prepublication draft [of the Smallwood report] was circulated for comment with prominent warnings that it was confidential and not to be shared more widely (I can personally vouch for this, since I was one of those asked to comment). Regrettably, Prof Ernst did precisely this, leaking it to The Times who used it as the basis of their lead story. The editor of The Lancet, Richard Horton, certainly no friend of homeopathy, promptly denounced Ernst for having “broken every professional code of scientific behaviour”. Sir Michael Peat, the Prince of Wales’ Principal Private Secretary, wrote to the vice chancellor of Exeter University protesting at the leak, and the university conducted an investigation. Ernst’s position became untenable, funding for his department dried up and he took early retirement. Thirteen years later he remains sore; in his latest book More Harm than Good? he attacks the Prince of Wales as “foolish and immoral”. Sadly it is true that Horton wrote these defaming words. Subsequently, I asked him to justify them explaining that they were being used by my university against me. He ignored several of my emails, but eventually he sent a reply. In it, he said that, since the university was investigating the issue, the truth would doubtlessly be disclosed. I remember that I was livid at the arrogance and ignorance of this reply. However, being in the middle of my university’s investigation against me, never did anything about it. Looking back at this part of the episode, I feel that Horton behaved abominably. But back to Dr Fisher. Why did his defamatory and false accusation in his new editorial come as a ‘big surprise’ to me? Should I not have gotten used to the often odd way in which some homeopaths handle the truth? Yes, I did get used to this phenomenon; but I am nevertheless surprised because I have tried to correct Fisher’s ‘error’ before. So, assuming that Dr Peter Fisher has seen my 2015 post, he is knowingly perpetuating a slanderous untruth. However, giving him the benefit of the doubt, he might not have read the post nor my memoir and could be unaware of the truth. Error or lie? I am determined to find out and will send him today’s post with an offer to clarify the situation. If I understand it correctly, Natalie was a guest in a public discussion about homeopathy somewhere in Austria during which my name must have been mentioned, and some homeopath or homeopathy-fan made the above allegation about me. Sadly, I was not present (but it is typical that allegations against me are rarely made to me in person) to discuss it further. I have undeclared ties to the pharmaceutical industry. I am incompetent or not even qualified. I was employed at Exeter to ditch alternative medicine. I have never done any original research. I sit in the ivory towers of academia. I have no clinical experience. I am basically a liar. Even though they have been repeated ad nauseam, all of these accusations are untrue and have been refuted so often that I do not want to go into them again (for those interested, see for instance here, here, here and here).However, the allegation that I am ‘influenced by ideological biases’ is a new one, at least to me. And therefore, it might deserve some serious consideration. An ideology is a system of ideas and ideals. Bias is an inclination or prejudice for or against one person or group, especially in a way considered to be unfair. Now let’s see how these two terms apply to me and my work. According to the definition above, I am clearly influenced by an ideology. Yes, I do have ideals! For instance, I believe in science, want to see sound evidence, hope to improve healthcare, insist that patients deserve the best treatments available, and feel that ethics are of paramount importance in healthcare. To make things worse, I am even proud of this ideology and I pity those who do not share it. What about bias? Do I hold a grudge against one person or a group of people? As I just stated, I pity those who do not share my ideals, and if I am brutally honest, I do not like charlatans, liars or entrepreneurs selling false hope. The question is whether this attitude is unfair. Personally, I do not believe it is, but I have to not deny that this is merely my perspective. There may be – and clearly are – other viewpoints. FROM THE PERSPECTIVE OF A CHARLATAN, I PROBABLY DO SEEM TO BE INFLUENCED BY ‘IDEOLOGICAL BIASES’. Governments must legislate to regulate and restrict the sale of complementary and alternative therapies, conclude authors of new book More Harm Than Good. Commercial organisations selling lethal weapons or addictive substances clearly exploit customers, damage third parties and undermine genuine autonomy. Purveyors of complementary and alternative medicine (CAM) do too, argue authors Edzard Ernst and Kevin Smith. The only downside to regulating such a controversial industry is that regulation could confer upon it an undeserved stamp of respectability and approval. At best, it can ensure the competent delivery of therapies that are inherently incompetent. This is just one of the ethical dilemmas at the heart of the book. In all areas of healthcare, consumers are entitled to expect essential elements of medical ethics to be upheld. These include access to competent, appropriately-trained practitioners who base treatment decisions on evidence from robust scientific research. Such requirements are frequently neglected, ignored or wilfully violated in CAM. “We would argue that a competent healthcare professional should be defined as one who practices or recommends plausible therapies that are supported by robust evidence,” says bioethicist Kevin Smith. “Regrettably, the reality is that many CAM proponents allow themselves to be deluded as to the efficacy or safety of their chosen therapy, thus putting at risk the health of those who heed their advice or receive their treatment,” he says. Therapies covered include homeopathy, acupuncture, chiropractic, iridology, Reiki, crystal healing, naturopathy, intercessory prayer, wet cupping, Bach flower therapy, Ukrain and craniosacral therapy. Their inappropriate use can not only raises false hope and inflicts financial hardship on consumers, but can also be dangerous; either through direct harm or because patients fail to receive more effective treatment. For example, advice given by homeopaths to diabetic patients has the potential to kill them; and when anthroposophic doctors advise against vaccination, they can be held responsible for measles outbreaks. There are even ethical concerns to subjecting such therapies to clinical research. In mainstream medical research, a convincing database from pre-clinical research is accumulated before patients are experimented upon. However, this is mostly not possible with CAM. Pre-scientific forms of medicine have been used since time immemorial, but their persistence alone does not make them credible or effective. Some are based on notions so deeply implausible that accepting them is tantamount to believing in magic. “Dogma and ideology, not rationality and evidence, are the drivers of CAM practice,” says Professor Edzard Ernst. 1st ed. 2018, XXV, 223 p.
As I already stated above, I hope you will read our new book. 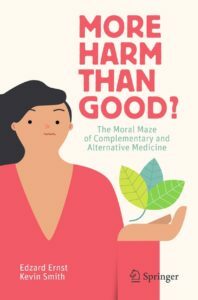 It offers something that has, I think, not been attempted before: it critically evaluates many aspects of alternative medicine by holding them to the ethical standards of medicine. Previously, we have often been asking WHERE IS THE EVIDENCE FOR THIS OR THAT CLAIM? In our book, we ask different questions: IS THIS OR THAT ASPECT OF ALTERNATIVE MEDICINE ETHICAL? Of course, the evidence question does come into this too, but our approach in this book is much broader. The conclusions we draw are often surprising, sometimes even provocative. Well, you will see for yourself (I hope). I AM SOOO PROUD!!! ‘Dr Rath Foundation’ published an entire article all about me! The ‘Dr Rath Foundation’ just published a truly wonderful (full of wonders) article about me. I want to publicly congratulate the author: he got my name right [but sadly not much more]. Here is the opening passage of the article which I encourage everyone to read in full [the numbers in square brackets refer to my comments below]. Professor Edzard Ernst, a retired German  physician and academic, has recently  become a prominent advocate of plans that could potentially outlaw  the entire profession of naturopathic doctors  in Germany. Promoting the nonsensical idea that naturopathic medicine somehow poses a risk to public health, Ernst attacks its practitioners as supposedly having been educated in “nonsense” . Tellingly, however, given that he himself has seemingly not published even so much as one completely original scientific trial of his own , Ernst’s apparent attempts to discredit natural healthcare approaches are largely reliant instead on his analysis or review of handpicked negative studies carried out by others . I am German-born, became an Austrian citizen in 1990, and since 2000 I am a British national. I have been critical about the German ‘Heilpraktiker’ for more than 20 years. This refers to the recent ‘Muensteraner Memorandum’ which is the work of an entire team of multidisciplinary experts and advocates reforming this profession. ‘Heilpraktiker’ are certainly not doctors; they have no academic or medical background. This is correct, and I stand by my statement that educating people in vitalism and other long-obsolete concepts is pure nonsense. Since I am researching alternative medicine, I have conducted and published about 40 ‘scientific trials’, and before that time (1993) I have published about the same number again in various other fields. This refers to systematic reviews which, by definition, include all the studies available on a defines research question, regardless of their conclusion (their aim is to minimise random and selection biases) . I hope you agree that these are a lot of mistakes (or are these even lies?) in just a short paragraph. Now you probably ask: who is Dr Rath? A qualified doctor who is thought to have made millions selling nutritional supplements around the globe through his website empire, Rath claimed his pills could reverse the course of Aids and distributed them free in South Africa, where campaigners, who have won a hard-fought battle to persuade the government to roll out free Aids drugs to keep millions alive, believe Rath’s activities led to deaths. I am sure you now understand why I am rather proud of being defamed by this source! Are critics of chiropractic ‘carpet bombers’? Similar words have been posted many times before. So, are we critics of chiropractic carpet bombers? Personally, I find the term very distasteful and misplaced. But let’s not be petty and forget about the terminology. The question is: should I be more supportive of chiropractors who claim to be reformers? I feel that the claim to be a reformer is hardly enough for gaining my support. I prefer to support clinicians who do the right things. And what would that be? follow the rules of medical ethics. What does that mean in relation to chiropractic? obtain fully informed consent from their patients which includes information about the nature of the condition, about the risks of their treatments, about other therapeutic options. As soon as I see a chiropractor or a group of chiropractors who fit these criteria, I will support them by publicly stating that they are doing alright (as should be normal for responsible healthcare practitioners). Until this time, I reject being called a carpet bomber and call such name-calling a stupid defence of quackery.